Similar to its single colored cousin the Irish Setter, the Irish Red and White Setter is an energetic and intelligent dog that is equally affectionate. Calmer and more focused thanks to its natural instincts, this breed gets along with everyone from children to pets and even strangers. They are easy to train if the owner is experienced and firm. A fairly independent dog, this is one that can handle some alone time without much worry. This is a highly energetic breed and requires lots of exercise and room to run. It is not suited for apartment or city life. This is a high energy breed that requires a lot of exercise or room to run. Regular grooming is necessary to keep mats and burrs from sticking in the fur. Otherwise the Irish Red and White Setter is an excellent breed for experienced owners. They are easy to train if trained from an early age consistently. This is a hardy breed. The most common health problems are Canine Leukocyte Adhesion Deficiency (CLAD), an autoimmune disease that affects the white blood cells ability to fight infection, cataracts, and Von Willebrand's disease. It is recommended that potential owners investigate the hereditary history of a potential puppy and have them examined by a Veterinarian before purchase. 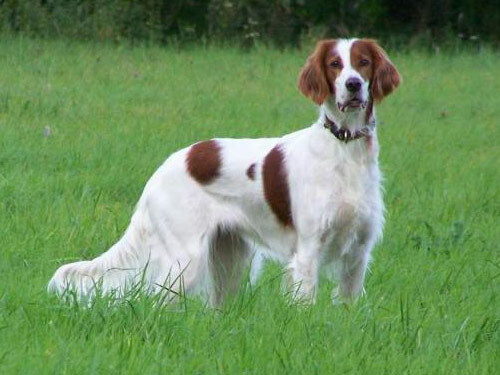 Often passed up for its solid colored cousin, the Irish Red and White Setter is the original of the breed and dates back to the 17th Century. A hunting dog, this breed was designed to set or crouch in front of prey to alert the hunter. In the mid nineteenth century, the bi-colored dog fell out of favor and was nearly extinct by WWI. Two cousins from County Down in Ireland recognized the plight of the Irish Red and White Setter and began an intensive breeding program that revived the breed.